Today, Dan and I had to run over to Tampa for a couple of errands. 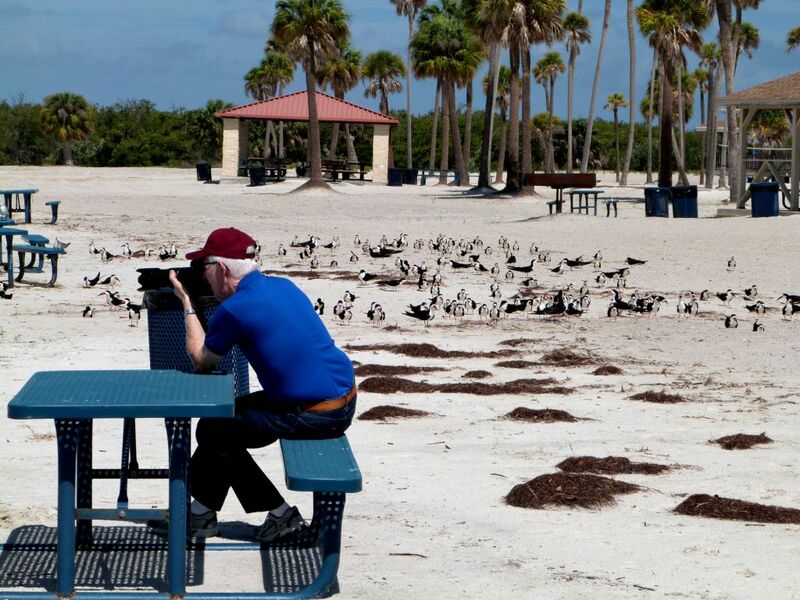 We stopped by the MacDill AF Base to see how the birds were faring out on their beach on Tampa Bay. 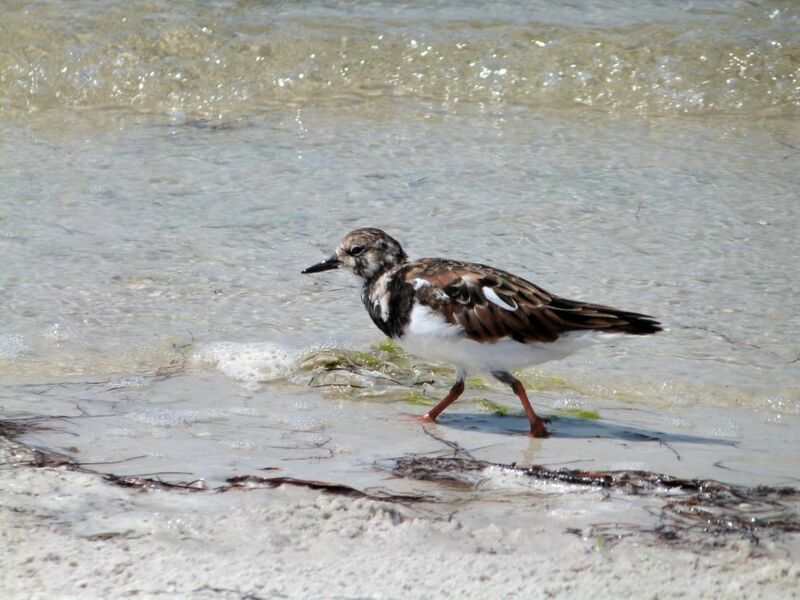 When we were there a month or so ago, there were lots of shorebirds. Since there have been many of reports lately from the Listing Service of migrants passing through the state, we thought we would take a look. Tampa is about 45 miles to the west of us and closer to the Gulf of Mexico. We didn’t have the time to go on over to the gulf. 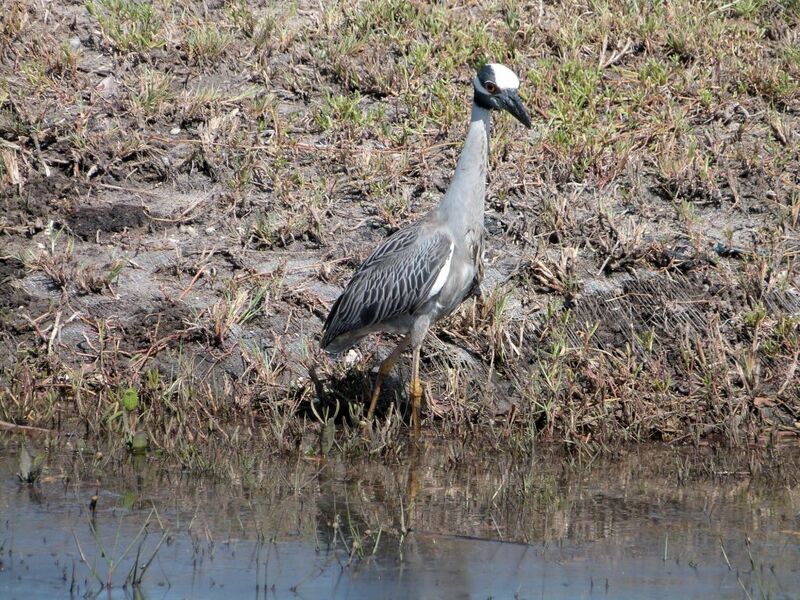 Our biggest surprise, and the only one, was a pair of Yellow-crowned Night Herons along one of the canals. Down at the beach, we only found the usual Skimmers, Laughing and Ring-billed Gulls, two kinds of Terns; Royal and Sandwich, Turnstones, Willet, White Ibises, and the proverbial Brown Pelicans flying by in formation. A little disappointing, but enjoyable none the less. Even when I only see one bird, I enjoy my birdwatching adventures. I assume most of the birds have already passed by or they were not in much of a beach mood today. Even though few species seen today, aren’t they all amazing to watch? I am always amazed at the variety of birds that we get the pleasures of watching. 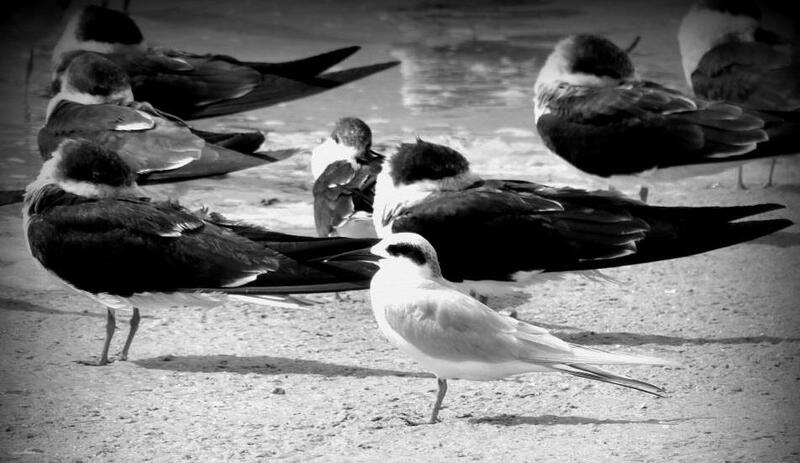 I also shot a video of some of the birds at the shore. 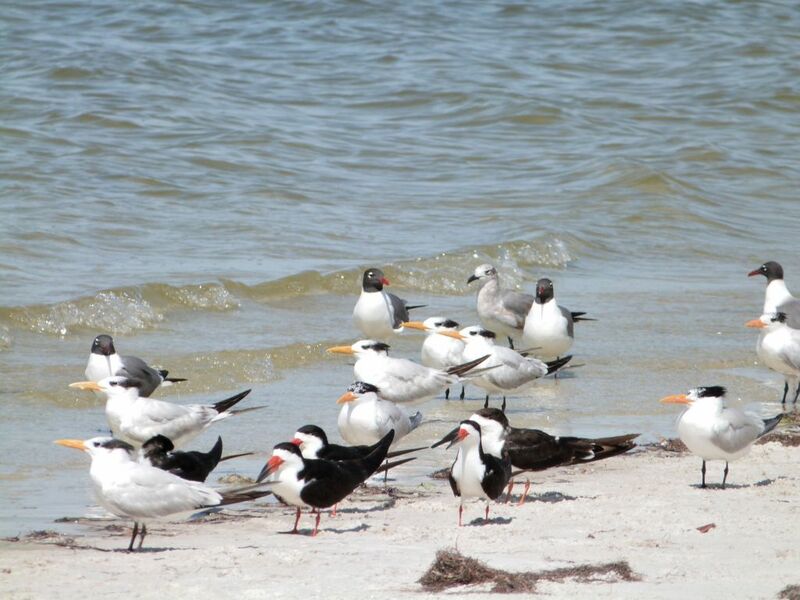 There are Black Skimmers, which I think are cute walking around, Royal Terns, Sandwich Tern and Laughing Gulls relaxing together. 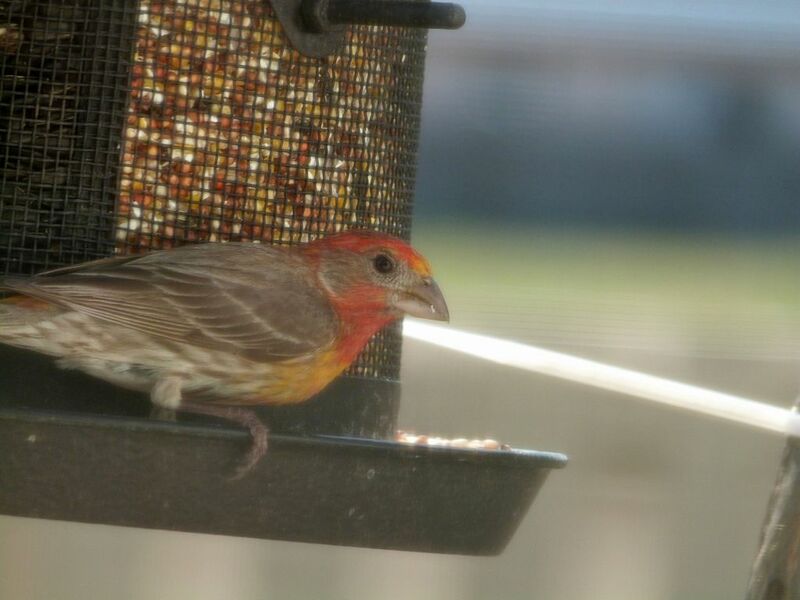 One other bird spotted out my back window a few days ago was this House Finch. All winter the normal House Finches and some orange variant ones visited the feeders. This one seems to have combined the two together. Thought it was rather different and wanted to share it. It was shot through the window and screen, so not the best shot. The Black Skimmer, Rynchops niger, is a tern-like seabird, one of three very similar birds species in the skimmer family. It breeds in North and South America. Northern populations winter in the warmer waters of the Caribbean and the tropical and subtropical Pacific coasts, but the South American races make only shorter movements in response to annual floods which extend their feeding areas in the river shallows. 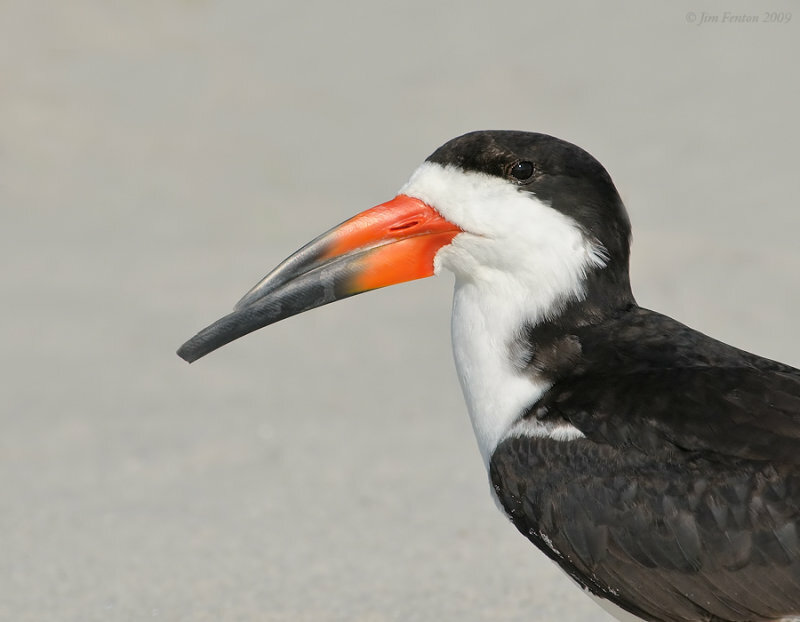 The Black Skimmer breeds in loose groups and its referred habitats include sandy or gravelly bars and beaches, shallow bays, estuaries, and salt marsh pools. 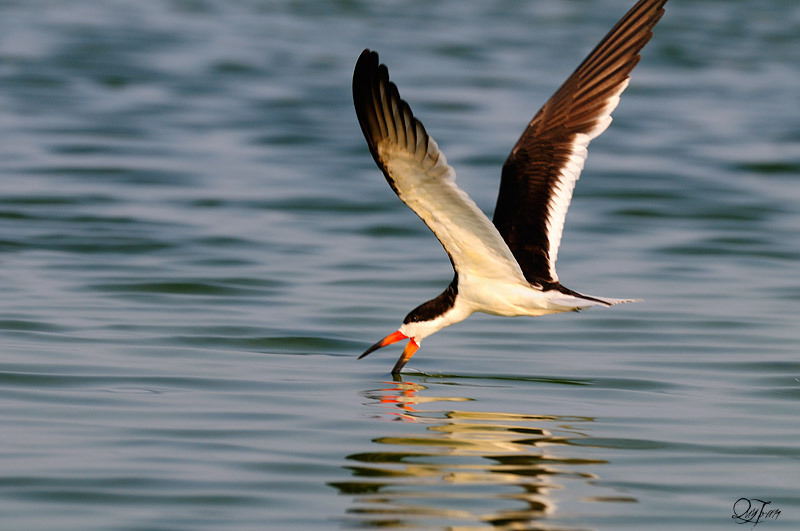 The remarkable bill of the Black Skimmer sets it apart from all other American birds. 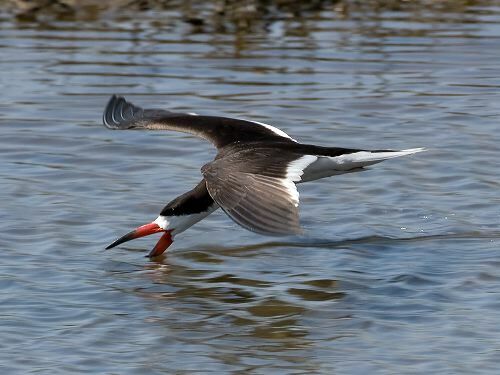 The Black Skimmer is the only American representative of the skimmer family. 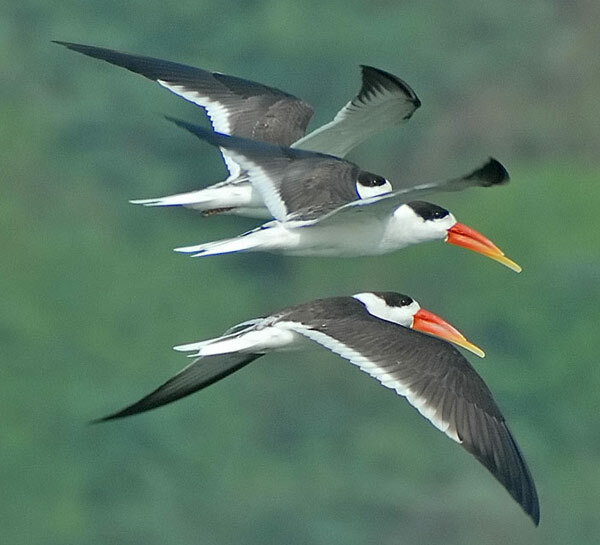 The other two, rather similar, species are the African Skimmer and the Indian Skimmer (by Nikhil). All use the same unusual feeding method. 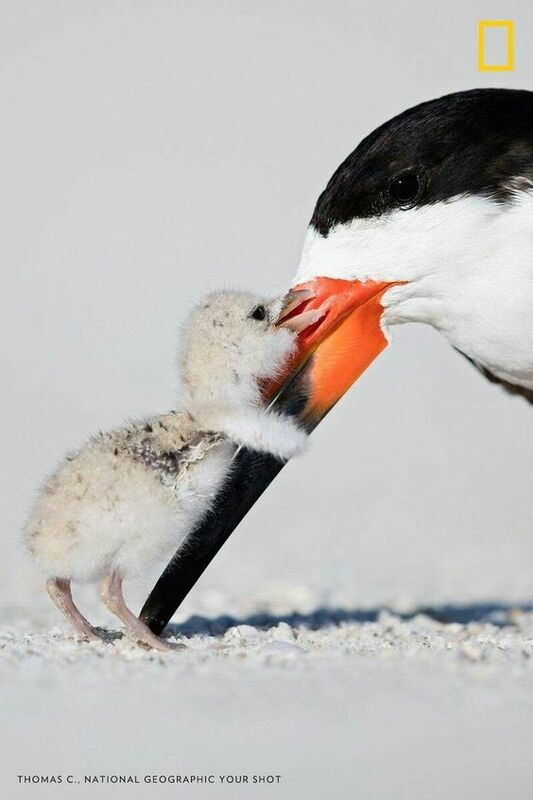 The Black Skimmer is the only bird species in the United States that has a larger lower mandible than upper mandible. 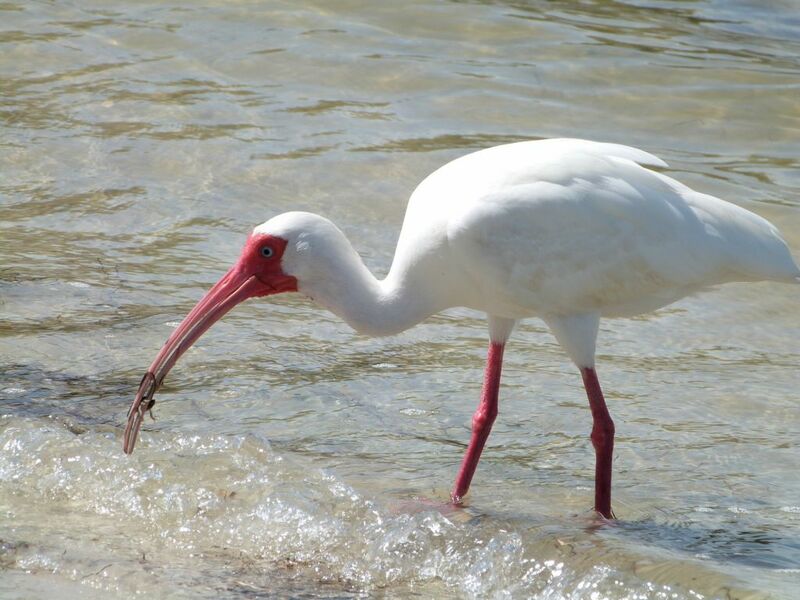 The large red and black bill is knife-thin and the lower mandible is longer than the upper. The bird drags the lower bill through the water as it flies along, hoping to catch small fish. At hatching, the two mandibles are equal in length, but by fledging at four weeks, the lower mandible is already nearly 1 cm longer than the upper. Its use of touch to catch fish lets it be successful in low light or darkness. Do you feel that your looks are not as good as the others? Do you feel that God could have created you a bit taller or fairer? Skimmers have a light graceful flight, with steady beats of their long wings. They feed usually in large flocks, flying low over the water surface with the lower mandible skimming the water (in order of importance) for small fish, insects, crustaceans and molluscs caught by touch by day or especially at night. They spend much time loafing gregariously on sandbars in the rivers, coasts and lagoons they frequent. Although the Black Skimmer is active throughout the day, it is largely crepuscular (active in the dawn and dusk) and even nocturnal…. That is the reason, they leave alone their younger ones at night, and forage during the night, flying low, skimming the water with their lower mandibles.. It is good to start the day reading the word of God.. But, how many of us read the Bible before going to bed? Do we carry the lamp during the day, or during the night? When darkness surrounds you and you have lost your way. Just read the Bible..
Jesus Himself had set an example of praying all through the night before He chose His twelve disciples…. 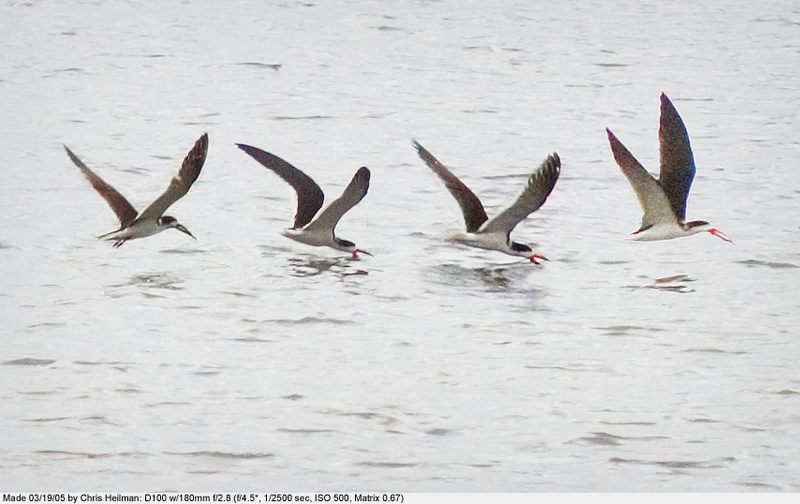 The Skimmers are in the Laridae Family of Gulls, Terns & Skimmers. They are part of the Charadriiformes Order. Keith made a video of a Black Skimmer flying about and dipping its beak. Its head pulls downward as it grabs a fish.